1. Criticism: There are few things so painful as criticism. It occasionally comes from those we know in person, but so often these days it hits hardest online, especially through the fickle world of social media and anonymous comments. When people criticize your work -- be it a project, a blog post, a pattern or book -- step back and take a deep breath before responding...if you must respond at all. Ask yourself if the criticism is valid. If it is, learn from it and move on. If it isn't, work through the emotions of the moment and then let it go. People say all kinds of things for all kinds of reasons, and their issues don't change who you are and why you do what you do. Take the advice of the people who matter in your life and leave the rest alone. 2. Comparison: No matter how long you’ve been sewing or how good you are at it, there’s someone out there who’s been doing it longer or “better” than you. Make peace with it and don't let it discourage you. Theodore Roosevelt famously said, “Comparison is the thief of joy.” If you spend all your time trying to keep up with everyone else, you’re missing the point. You can appreciate the talents of others without feeling bad about your own skills. Gain inspiration and knowledge where you can and keep making what you love. 3. Perfectionism: As a perfectionist myself, I have a lot of understanding for those who struggle to get each project exactly right. It’s so easy to praise each other’s work and downplay the flaws, but oh, how we struggle to do the same with our own projects. Give yourself the same grace that you would share with a friend, practice where you need to, and let go of your mistakes. Someone reminded me once that so-called "perfect" work is done entirely by machines, while the little imperfections in our projects show that they were created by human hands. There can be beauty even in our limitations. 4. 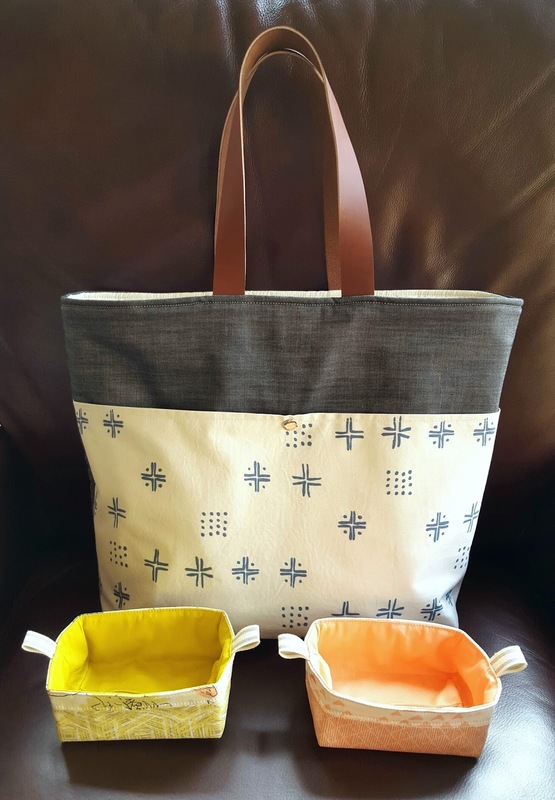 Stagnation: There will come a day (if it hasn’t already) when you sit down at your sewing machine, look at your fabric, pick up the project you’ve been working on...and feel no desire whatsoever to sew. It can be a little unsettling when the thing that brought you so much happiness suddenly seems difficult, burdensome, or just plain blah. Don’t let it throw you. Any hobby can get a little stale after a while, even sewing. Sometimes the best thing to do is step away from it for a few days or even indulge in another favorite past time for a week or two. Odds are pretty good that when you walk back to that sewing table after a break, you’ll be refreshed and ready to start creating again. The most important thing to remember when facing any of these issues is that you're not the only one. We all deal with frustrations, hurts, and disappointments in our creative work at one time or another. They’re not the end of the world, and they won’t steal your joy unless you let them. Don’t ever let them. Be who you are and love what you make. It's always the best way to go. This quilt...it's been a year and a half in the making. 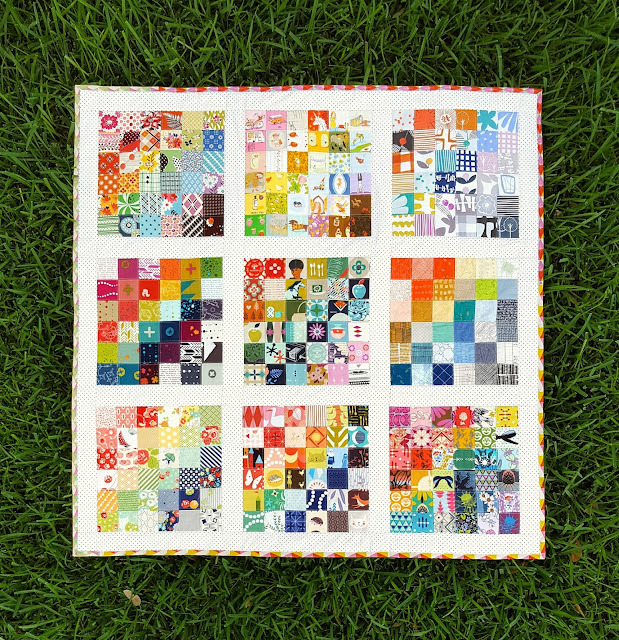 I first designed the Summer Tourist Quilt for my book, Sew Organized for the Busy Girl, back in 2013. In the original version, each of the 9 blocks is made up of 36 squares all containing a single color (red, orange, yellow, green, aqua, blue, purple, pink, and gray). From a distance, it almost looks like a paint box full of watercolors. I absolutely love that quilt. But then I thought, wouldn't it be fun to do a version where, rather than focusing on color, each block featured only fabrics from a single designer? 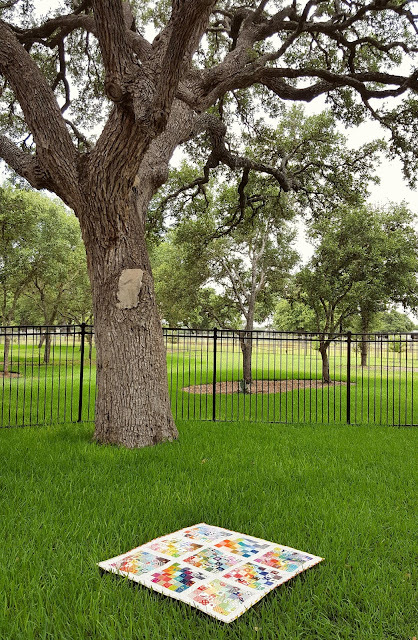 I tucked the idea away until the book was finished, finishing a few blocks during early 2015. Soon after, though, our family was plunged into the chaos of packing up our home in California, moving to Texas, and settling into our new home. It wasn't until recent months that I was able to pick up this project again and work at it here and there between other assignments. And then this week I spotted the project box where I've been keeping my blocks and materials, and I decided that it was time. This quilt deserved to be finished. I spent the weekend working on it during every free moment I had, sewing the last stitch last night after the girls were in bed. 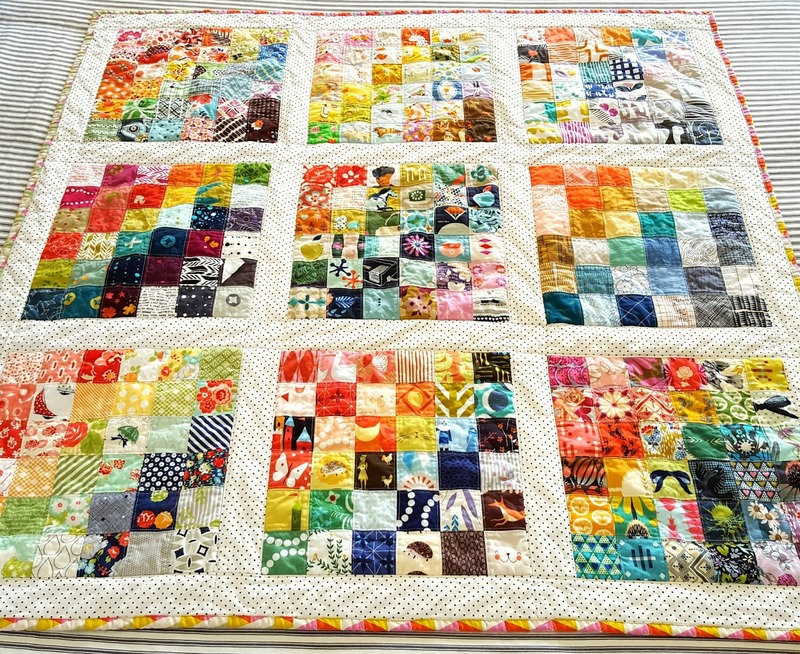 It was so hard to limit myself to just 9 blocks for this quilt. 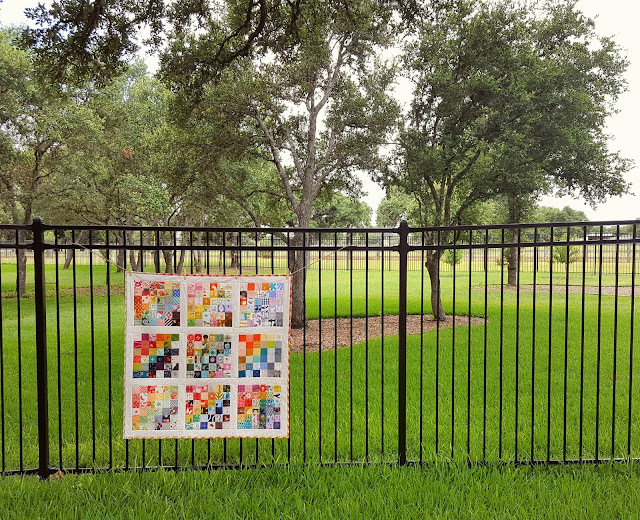 I seriously considered adding at least another row so that I could feature more fabric designers, but in the end, I felt that it was more important to finish the quilt. 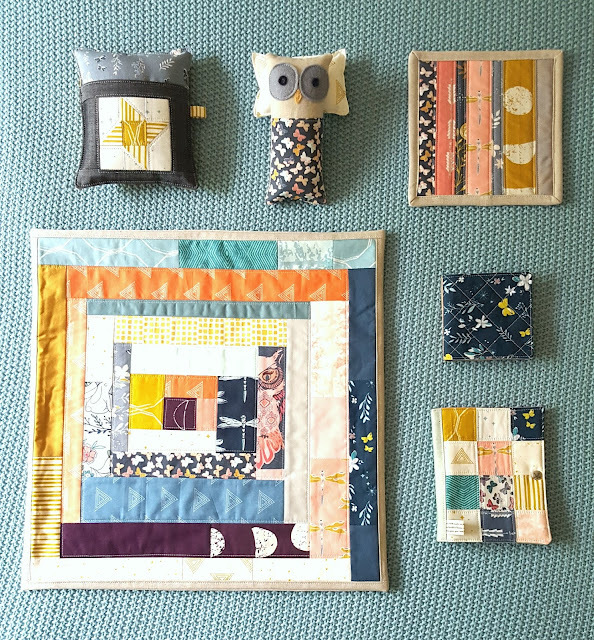 The blocks feature fabric from the following designers (from top to bottom, left to right): Denyse Schmidt, Heather Ross, Lotta Jansdotter, Alison Glass, Melody Miller, Carolyn Friedlander, Bonnie & Camille, Lizzy House, and Anna Maria Horner. Since many of these were finished a year ago, there are newer fabrics missing from the blocks which I would have loved to add, but so it goes. I still have bags set aside with fabric that I had hoped to use by other talented women like Heather Bailey, Tula Pink, Lori Holt, Rashida Coleman Hale...the list goes on and on. 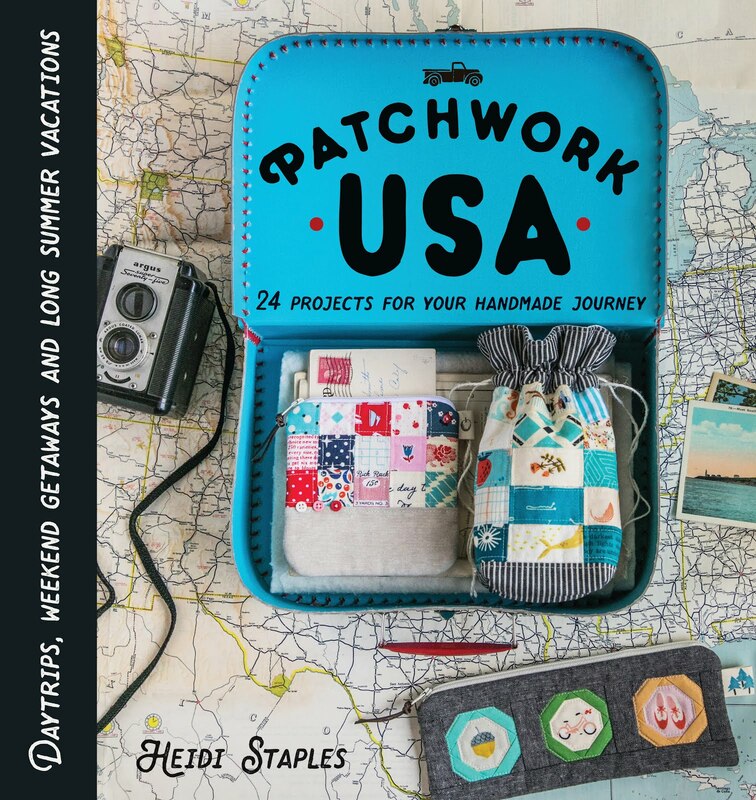 I would really love to do another designer based project in the future, maybe a Weekend Tourist quilt (also from my book) with smaller blocks by more designers. 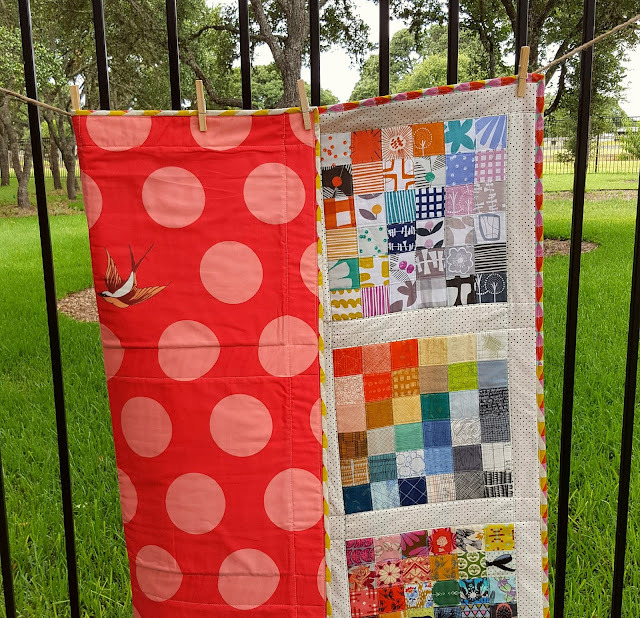 I used a La Creme dot print by Riley Blake for the sashing, quilting each block separately to the batting before joining them all together with batting backed sashing pieces. 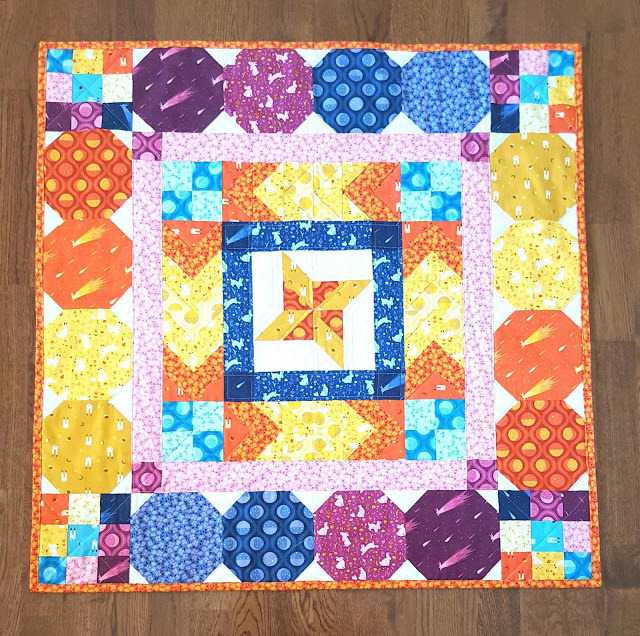 It was a different way to construct the quilt, but it allowed me to do more extensive quilting on the blocks than I normally do on a full quilt top. 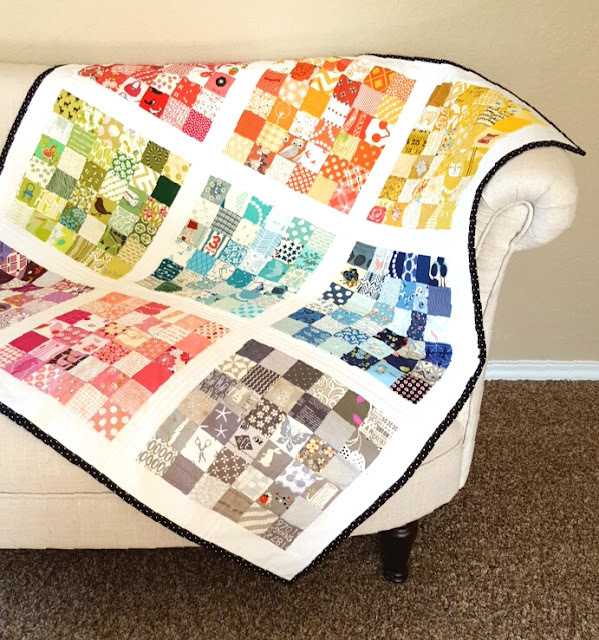 The quilt is backed in Tula Pink's Free Fall wide back fabric and bound in Melody Miller's Facet print in pink from the Garland collection. Both prints are gorgeous, and I love the way they work together. So now I sit typing on my bed with the finished quilt nearby, fresh from the dryer, a warm and crinkly expanse of rainbow colored joy beside me. 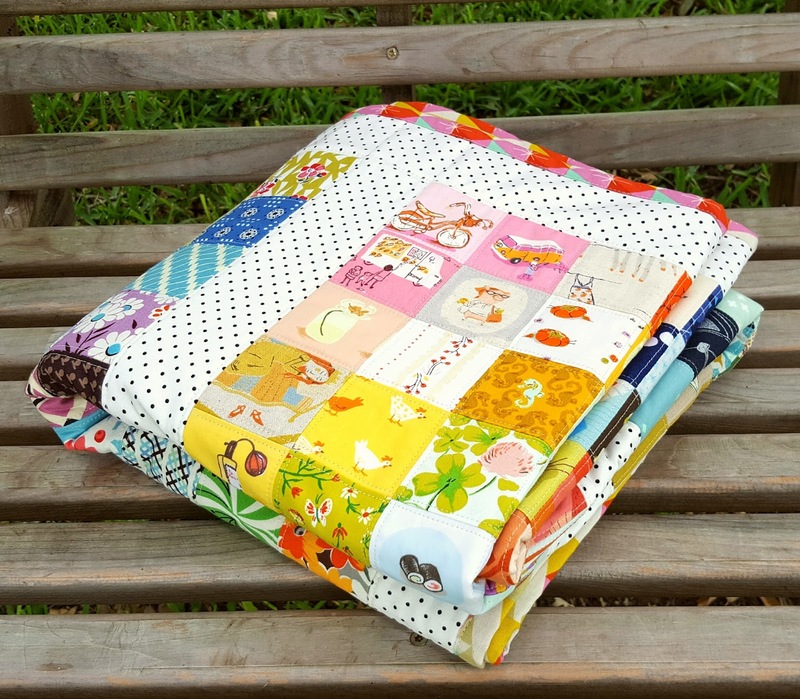 I snagged a sample spree bundle of Sarah Watts' new From Porto with Love collection from Modern Quilter after Quilt Market, and I think it's one of her best. 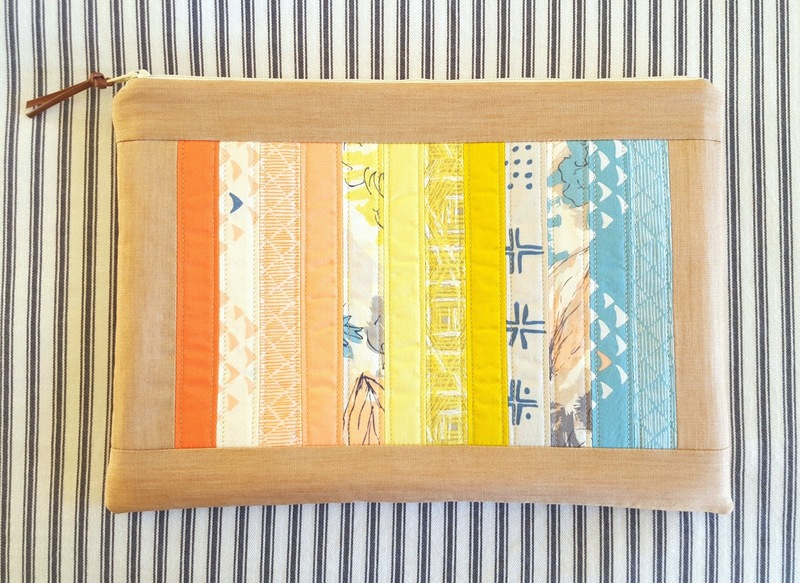 The colors are lovely, and the details are perfect -- so much great material for fussy cutting. I combined it with a few prints from Anna Rifle Bond's Les Fleurs collection for this small project. We had a difficult weekend of health issues with Bunny, spending several nights in the hospital, and though we're joyful to say that the doctor is getting to the bottom of her breathing issues, it's all been pretty exhausting and emotional. So once again, I embraced a little patchwork therapy. 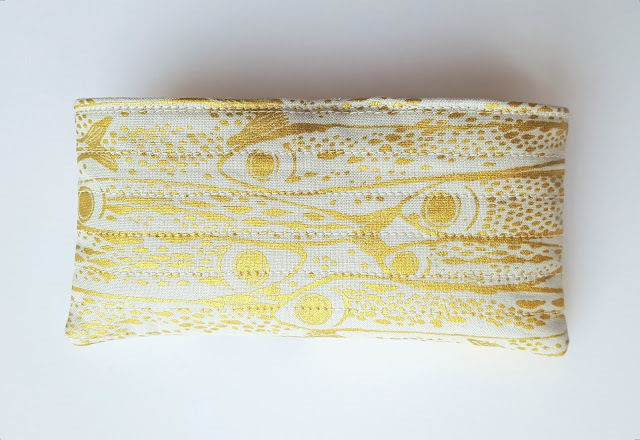 I originally planned this pocket to be for my sunglasses, but it turned out to be a bit too small for that. Happily, though, it's exactly the right size for the little package of Kleenex that I keep in my purse. The pocket is lined in a peach City Toile print, a soft lawn that features gold metallic designs. 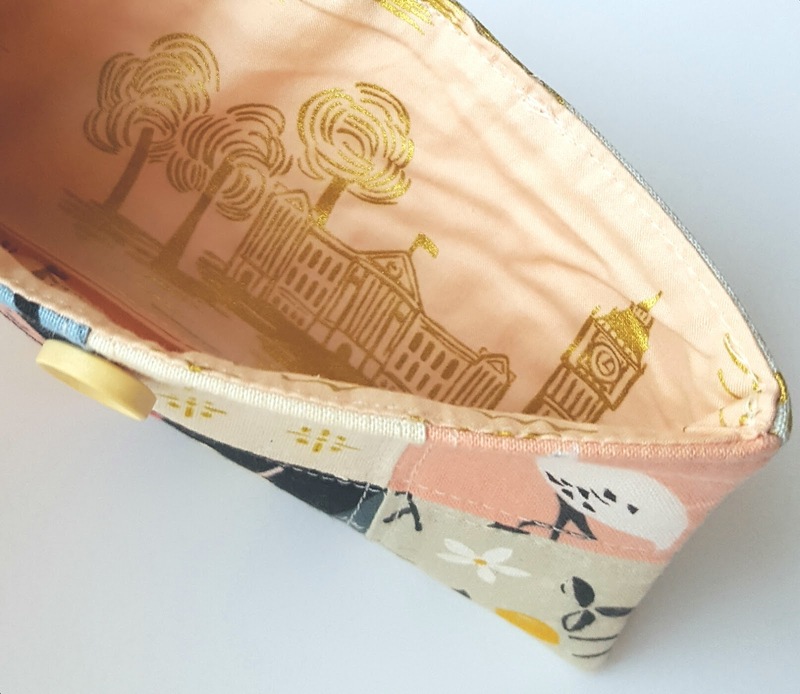 It makes such a gorgeous lining and goes perfectly with the travel theme that I was using for this project. For the back, I used another metallic print from Sarah's collection. Sardines never looked so beautiful! Another week, another small project...just the way I like it. 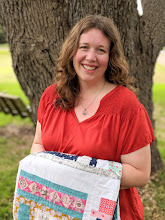 Today is my stop on the Desert Bloom blog tour, and I really enjoyed playing with Amanda's sweet fabrics. This collection is inspired by her home state of Utah, so it was a very personal one for her. Since I normally work with a lot of colors in my projects, it was a nice challenge for me to make something using a more limited color palette. 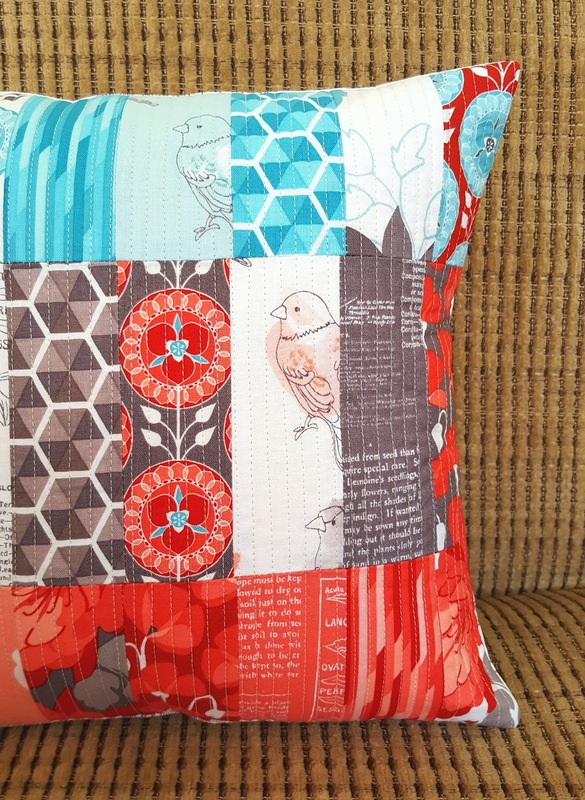 Because these prints feel more modern than my typical choices, I decided to follow that style in the 12" pillow cover I made from them. I cut approximately 2" wide strips from a charm pack, arranging them in three rows according to color: reds, aquas, and neutrals. I didn't bother with exact measurements, trying to be more improvisational in the construction of the pillow top. I sewed the strips together, sewed the rows together, and then quilted them in straight vertical lines about 1/4" apart. It's a very simple design, but I think it works well. 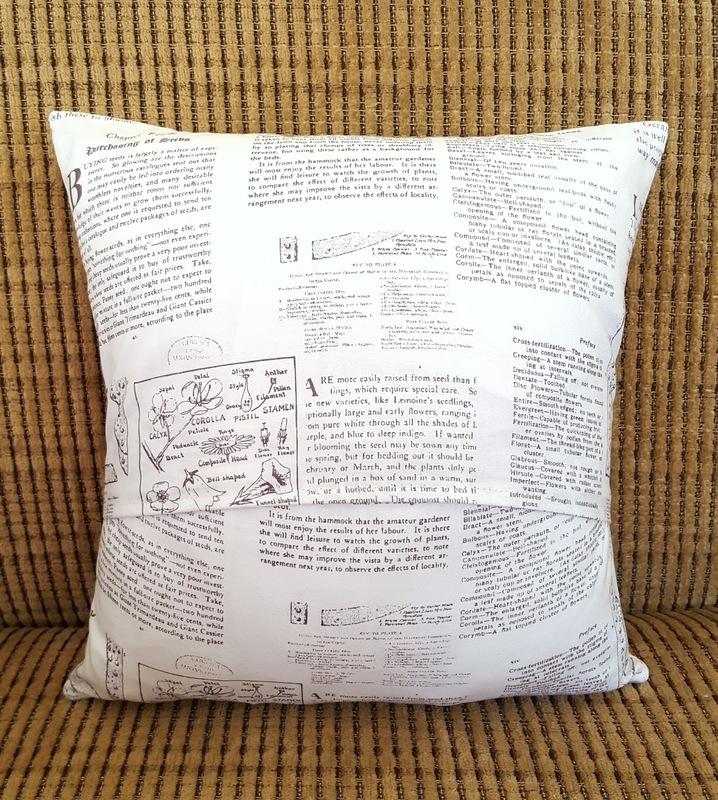 For the pillow backing, I used my favorite print in the entire collection: Desert Text in white. It's such a fabulous text print with a slightly vintage feel to it. I will definitely be using it in other projects! I was taking photos of the pillow in our living room when my youngest daughter walked in, saw the pillow, and gasped loudly. "Can I have it?" she begged. "Can I have it when you're done?" She danced around me in excitement until I took the last picture and handed it to her. "Thank you!" she squealed and dashed off. I haven't seen the pillow since. You can find more details about the Desert Bloom blog tour on Amanda's blog right here. There are some fabulous people sharing projects for this tour, so be sure to check it out! The Planetary Mini Medallion Quilt above was made using Felice Regina's Luna Sol collection for Windham. 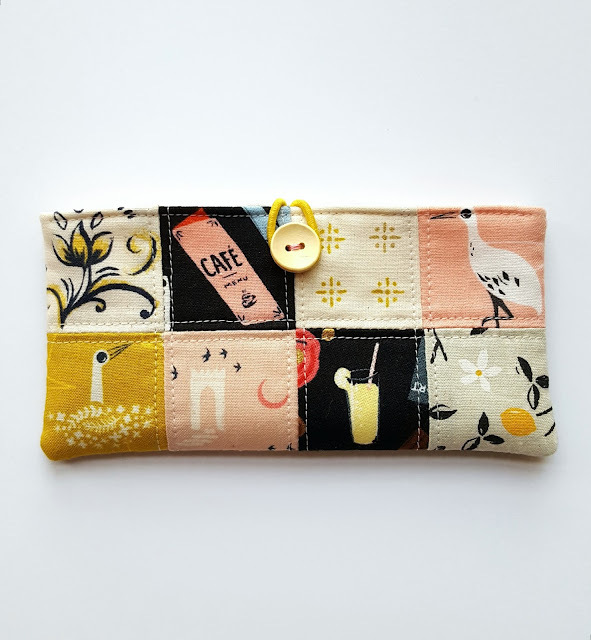 This is Felice's first fabric collection, and I'm so thrilled for her! The colors in this line are so gorgeous, and I love those little bunnies. 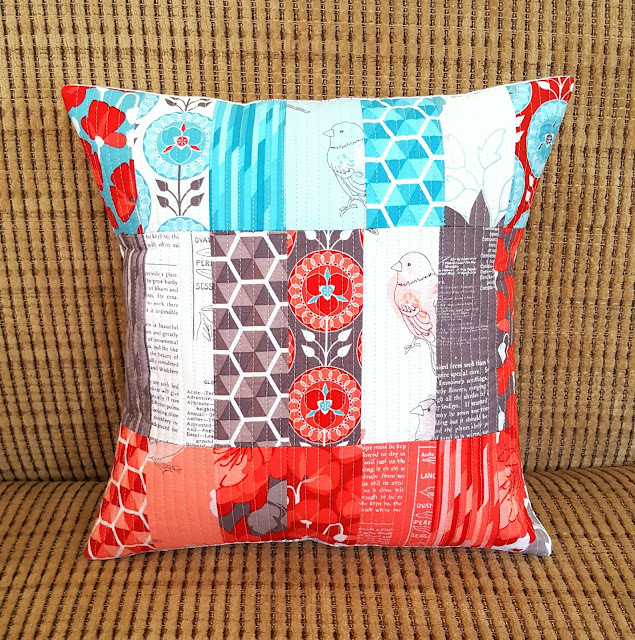 There will be a tutorial for this mini quilt in the fall when the fabric starts hitting stores. Amy Sinibaldi asked me to make a mini quilt for her Playground booth for Art Gallery Fabrics. This collection is so sweet, and I love the color range. 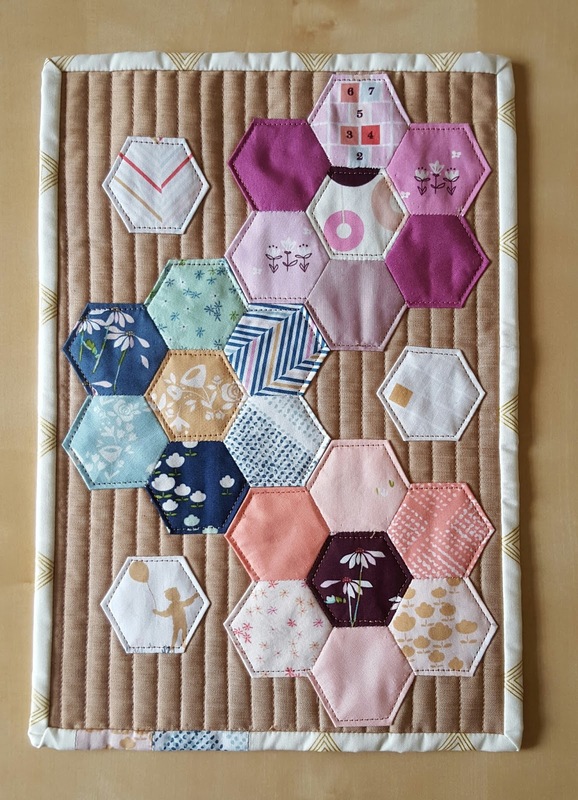 Since I was working with tiny pieces of fabric, I decided to sew hexagons on a background of Adobe Clay denim. It was such a fun project! Sharon Holland and I worked together for weeks to coordinate ideas for the projects I would make for her Tapestry booth for Art Gallery Fabrics. This collection is somehow rustic and modern at the same time, and it feels like a soft breath of summer every time I look at these prints. 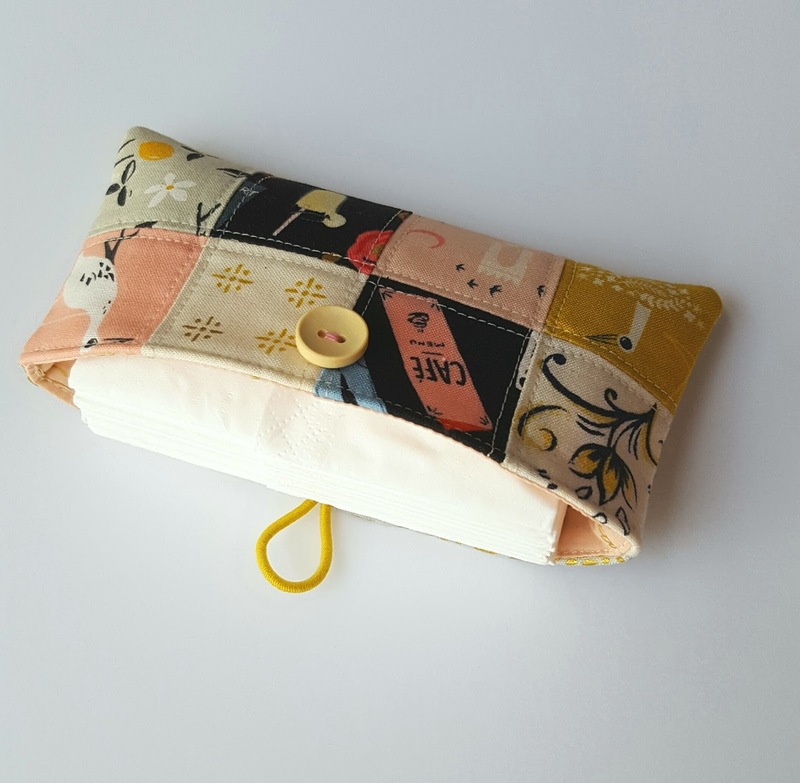 I made a number of items from this fabric starting with the Spectrum Clutch, a free tutorial here on my blog. 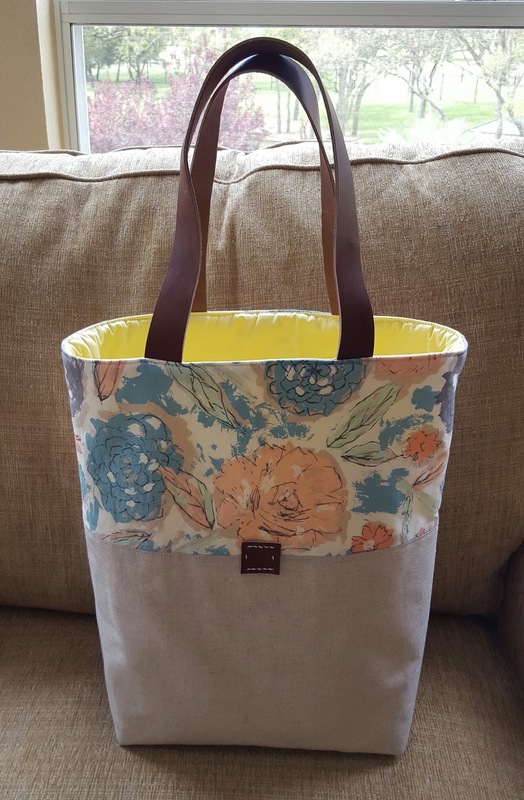 I love this large tote bag, so perfect for a day at the beach. And yes, those are a few of my Pixie Baskets with it! Leather made such a great accent for these prints. I used it with almost every project. This little tote bag even has a leather label on the front sporting the initials FM -- for Fabric Mutt, of course. I'm so delighted that AGF is making linen and denim now. 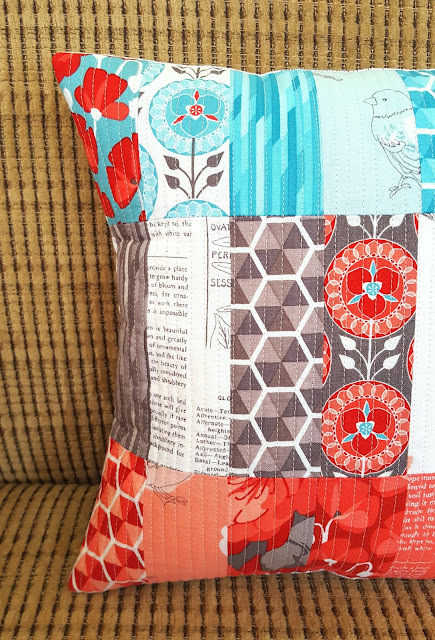 They pair beautifully with colorful prints like this one. This clutch was so simple to make but looks far more intricate thanks to that embroidery print. Aren't those printed stitches lovely? Almost all of these projects are just developed as I go, and I really enjoy the chance to experiment with new ideas. 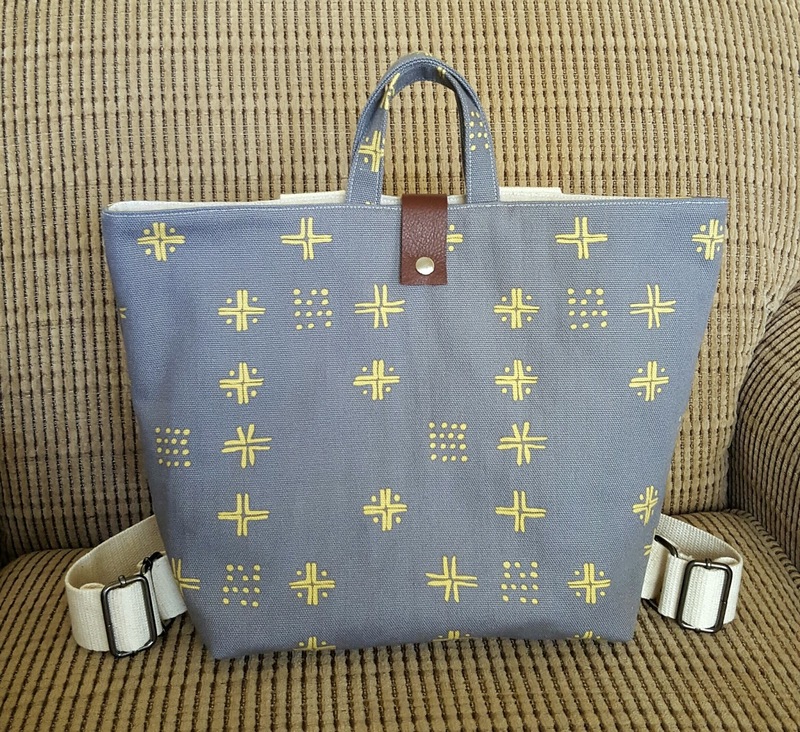 This was a combination tote bag and backpack made with Sharon's canvas, and I love the way it turned out. My daughters all wanted to use it immediately! 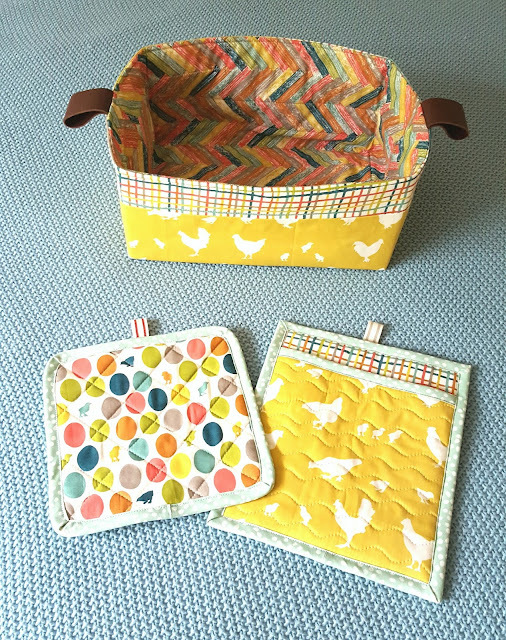 I sewed a bunch of little things for Maureen Cracknell's Nightfall booth for Art Gallery Fabrics. Maureen's collections are always so whimsical, and it's fun to try to match that in the projects I make for her. My favorite project of those above was definitely the little owl that I made using the Sleepy-Time Friend pattern from my book. 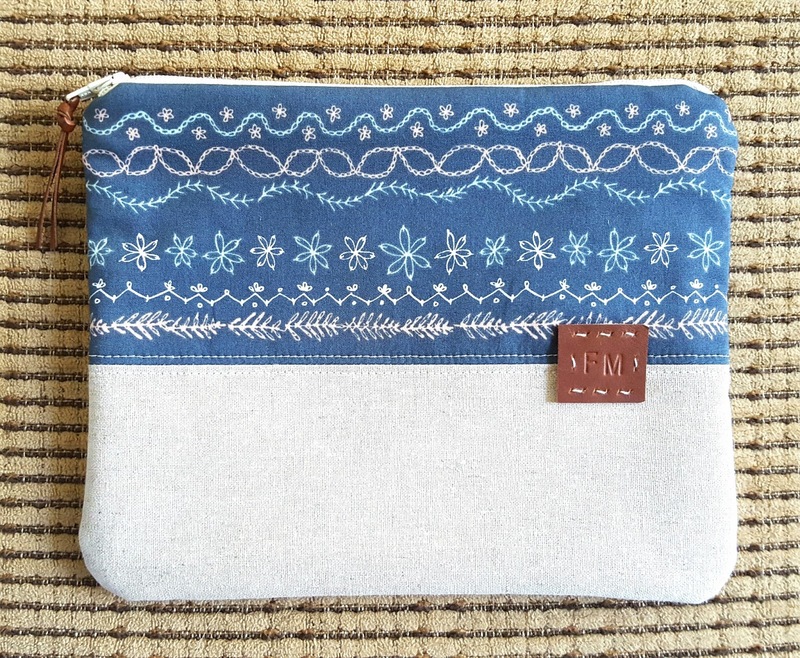 I also sewed a pillow cover, Deluxe Pincushion (also from my book), Pocket Mending Book, and Stationery Kit. 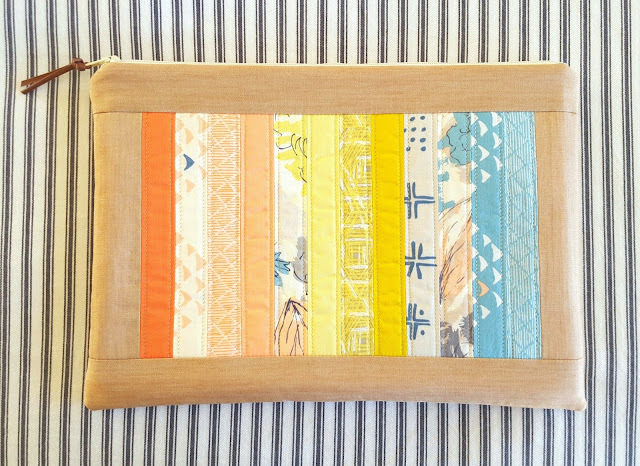 I've been sewing samples for my friends at Birch Fabrics for years now. 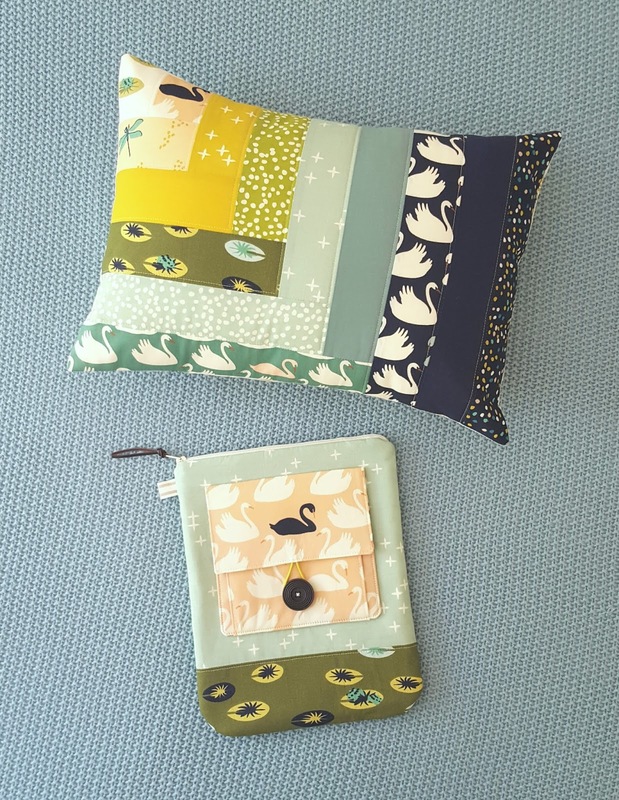 I made a log cabin pillow and a Girl Friday Sewing Case (from my book) using their new Swan Lake collection. 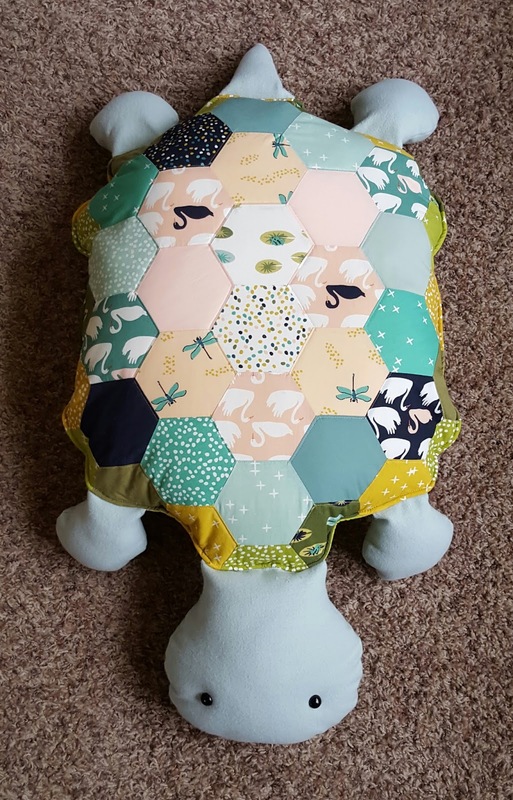 My biggest challenge, though, was making Tiffy Turtle, a giant floor pillow. There will be a tutorial for a slightly smaller version coming out this summer. Tiffy was definitely the hardest sample to relinquish when I was done. We all fell in love with her! I also made a giant Pixie Basket and two potholders using the Birch Farm Fresh collection. These prints are so happy and bright!